Like so many soccer fairy tales, Fernando Clavijo's soccer career began in a park. Only for Clavijo, it was his second soccer career. He was 22 when he quit soccer in his native Uruguay, tired of the soccer politics that had tied him down, and he and his wife, Martha, moved to the United States. Clavijo took a job as a bus boy at a New Jersey restaurant -- protected by fellow staff members when immigration swept through the place -- and played soccer on an Italian team in the park at night with no intentions of playing professionally again when someone saw him play and suggested he try out for the ASL's New York Apollo. The Apollo (later New York United) played in the shadows of the New York Cosmos, but it attracted lots of players from the New York area interested in continuing their careers. Clavijo joined the Apollo in 1979 and his teammates during his three ASL seasons included the likes of Joe Fink, a star on the Cosmos in the pre-Pele days, future U.S. national team player Michael Collins, even Charlie Stillitano, now the executive chairman of Relevent Sports. Thus began 40 years of one of the richest careers anyone has ever had in American soccer. -- FC Dallas technical director for the last seven years (stepping down last fall to focus on his health). That doesn't include other coaching jobs he had in soccer -- MLS, NASL, MISL, CISL (photo), Project 40, futsal -- or his work for Traffic Sports as director of soccer between his jobs with the Rapids and FC Dallas. Perhaps Clavijo's most important work, though, came in recent years when he helped build the FC Dallas academy, giving opportunities to players like he got when he moved to the United States. “Fernando was a soccer pioneer," said FC Dallas president Dan Hunt in a statement. "His knowledge and passion for the sport were unparalleled. While he was a phenomenal soccer mind, he was an ever better person who brightened the day of everyone he met." 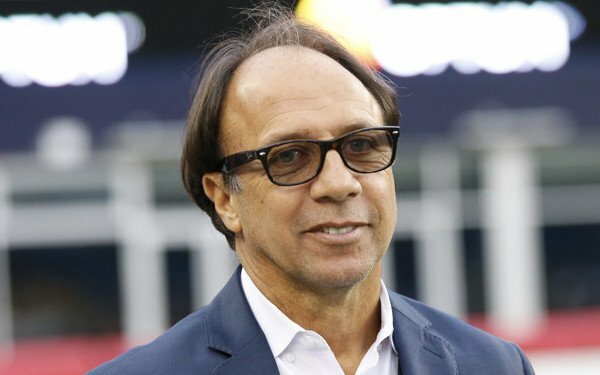 Clavijo was inducted into the National Soccer Hall of Fame in 2005 alongside World Cup 1994 teammates Tab Ramos, Marcelo Balboa and John Harkes and former U.S. Soccer secretary general Hank Steinbrecher and five pre-NASL players. Balboa was particularly close to Clavijo. “He's Uruguayan through and through," Balboa told the FC Dallas web site in 2017, "but he's also American through and through. I think where the passion comes from is the opportunity and how hard he had to work to become a professional soccer player in this country." Clavijo once told Soccer America contributor Brian Sciaretta of how a Uruguayan friend gave him a Uruguayan jersey, which he accepted, but when the friend asked him to put it on so he could take a picture, he declined, saying he couldn't wear a jersey other than a U.S. jersey, which he wore 61 times. Fernando Clavijo is survived by his wife, Martha and their sons Nico and Jonathan. 9 comments about "Fernando Clavijo (1956-2019): Forty years of contributions as a player, coach and executive". Kent James, February 10, 2019 at 9:15 a.m.
Soccer has been losing a lot of great people lately. He died much too young. He will be missed. frank schoon replied, February 10, 2019 at 1:58 p.m.
Ric Fonseca, February 10, 2019 at 2:19 p.m. I also had the pleasure of meeting and briefly working with Fernando during WC USA, and more specifically when we'd formed the Latian American Soccer Coaches Association (LASCA pre-WC USA after the US Soccer Convention in Santa Clara Unive (Calif) and when he later attended our annual meetings. Descansa en Paz, Gran Caballero Fernando!!! stewart hayes, February 10, 2019 at 2:46 p.m. Sad to learn that he has died. I really enjoyed watching him play he as an inspiration for many. Sandi Collins, February 10, 2019 at 3:01 p.m.
To say I am shocked is a tremendous understatement. I knew, through our Facebook friendship that Fernando had been treated at MD Anderson Medical Center in Houston. Because a dear family friend had been treated there, I knew Fernando was in the best hands possible. Sadly, there were no lasting miracles this time. My heart goes out to his lovely family and to all the close friends who will feel his loss so deeply. I only met Fernando, Martha, Jonathan and Nico one time, at the 2005 Induction Weekend - pictured above. Those of us associated with the NSHOF in Oneonta cherished our times meeting inductees at the Albany, NY airport and driving them (and their families) to "their weekend". Fernando and Martha were my guests as was Nico (I believe....either Nico came with us and Jonathan was arriving later or the reverse). From the moment we met I knew they were an exceptional, loving family that drew everyone they met into that circle of acceptance. We took Martha to the hotel but Fernando and Nico came with me to the Hall of Fame to experience it for the first time. We walked through the NASL exhibit while Fernando gave us a personal histoy lesson about many of the players pictured there. Our next stop was the main exhibit hall. On the screen they were playing a tape of the 1994 USA v Colombia World Cup match. I asked if that was "The" match and he responded, "Yes, I was playing". The three of us stood there, in silence, for quite a while with tears running down our cheeks in memory of a young man - Andre Escobar who, tragically, had his life stolen because of an own goal in that game. Being exposed to Fernando's humanity, caring, honesty and his great heart, at that moment, has stayed with me since then. E Muschick, February 10, 2019 at 4:38 p.m. Prior to WC1994: I knew Fernando from indoor play with the Storm and that he was on Bora's scope for the '94 team. Whenever I went to the St. Louis Soccer Park: who is working out, all by himself....up and down Field Nr. 5...like a dog was chasing him...with and without the ball. So we talked after many of these solo sessions. What a wonderful person...soccer was his life! Michael Saunders, February 10, 2019 at 10:05 p.m.
Last saw Fernando at the HoF induction cermonies in Frisco, TX last October. We hugged, laughed and reminicsed. I reminded him that my first professional level assignment as the referee, he was the defender for the Apollo. He became my first caution at that level. He simply laughed again, and said "I deserved it". He was more than a soccer player, a coach, or a technical director. He was what we call a real "mensch". He fought his dreaded disease right to the end. The game will miss him. Why do the good die young? I am just gutted. Scott French, February 12, 2019 at 5:39 a.m.
One of the truly great people in the game. Wonderful competitior and soccer mind, but an even better man. John Foust, February 14, 2019 at 3:05 p.m.
As a season ticket-holder when we lived in San Diego in the 80s, I took my new-born/young kids to see Sockers' games and tried to point out what was happening on the pitch (indoor and outdoor). Fernando was always one of the sining examples to point out visionary passing and elegant ball handling. Met him behind the scenes after one of the indoor games (my wife know Hugo Perez's wife so we got that great invitation!) ... just a quick intro handshake - along with some other greats of that time - which now looms large in my memory with this sad news. But these examples of classy people playing the beautiful game with class reminds me why I will eternally be a fan. RIP and prayers for the family.